The OM-CP-HITEMP150-PT is a submersible, temperature data logger that can operate up to 150°C (302°F) and has a 607 mm (24") flexible, stainless steel probe. The probe is durable and can be spiraled, bent or angled in any direction, making it easy to log temperatures within bottles, vials or other hard to reach places. The OM-CP-HITEMP150-PT can measure and record temperatures between -200 and 260°C (-328 to 500°F). Users can select reading rate options from 1 reading every second to one every 12 hours. The storage medium is non-volatile solid state memory, providing maximum data security even if the battery becomes discharged. The OM-CP-HITEMP150-PT-TSK is a kit that includes an OM-CP-HITEMP150-PT data logger enclosed in a thermal shield. This durable system can withstand temperatures up to 250°C (482°F). The thermal shield can be easily removed from the OM-CP-HITEMP150-PT-TSK, so it may be used as a standalone data logger also. Installing the data logger back into the thermal shield is simple, just open the enclosure, thread the probe through the end cap and fasten the thermal barrier together. 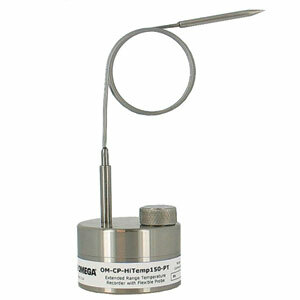 The OM-CP-HITEMP150-PT-TSK is submersible and has a 24" flexible, stainless steel probe. The probe is durable and can be spiraled, bent or angled in any direction, making it easy to log temperatures within bottles, vials or other hard to reach places. These two devices can be started and stopped directly from a computer and their compact design allows them to fit almost anywhere. Data retrieval is simple. Plug the device into an available USB port and our easy-to-use software does the rest. The software converts a PC into a real-time strip chart recorder. Data can be printed in graphical and tabular format or exported to a text or Microsoft Excel file. Start Modes: Software programmable immediate start or delay start up to six months in advance. 注: Comes complete with 3.9V lithium battery. Operator’s manual and USB interface cable are included with the OM-CP-IFC200 software/cable package (required for data logger operation, sold separately).